Diameter of Just Under 1.8"
Styled in a black finish, the On-Stage TM02B Flange Mount is designed for mounting mic clips to flat surfaces. With a diameter of just under 1.8", the TM02B features three screw holes for drilling the unit into compatible flat surfaces, and it includes screws for this very purpose. Its 5/8"-27 thread fits most standard mic clips. 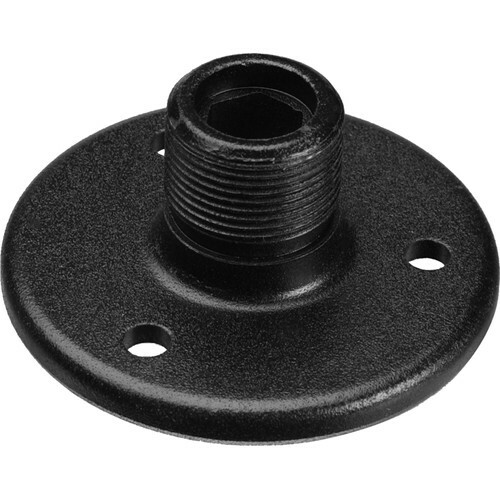 Box Dimensions (LxWxH) 4.0 x 2.45 x 0.35"
TM02B Flange Mount (Black) is rated 4.7 out of 5 by 11. Rated 5 out of 5 by Nemanja from affordable and well made I made my own custom mic stand using this little guy, a small podium I mad fron mahogany, and the gooseneck. Works great for my live performances. The screws that come with the flange are nice and sharp and the stay tight in the wood. A drop of super glue, while screwing in, will make it even more solid. Rated 5 out of 5 by Brad the guitar hound from Just what I was looking for. This is just what I needed in my home studio. I use it on my desk space to mount goose necks or mic extensions so that I can easily set up a mic or pop screen or whatever is needed. It takes up very little space and yet is very stable. This has been a very handy addition for very little money. Rated 5 out of 5 by Chuck the AV guy from Great podium mic adaptor We bought these to be permanently mounted on our hotel podiums and they work great! Much better than putting stands on these, and they look great! Rated 5 out of 5 by Anonymous from Mic flange to reduce mic stands I use this to fit a stereo pair of mics in a tight spot where mic stands have trouble fitting. creative use that is. works 100% great. Rated 3 out of 5 by Anonymous from I would buy this again I use this part to attach to a digital microscope to make it easier to use and help reposition. Worked out great. Rated 5 out of 5 by Anonymous from Great Mic Mount! Perfect mount for a small podium. Doesn't take up a lot of room and looks good. Rated 5 out of 5 by LF from Flange mount was perfect I use the Flange mount on my music stand to hold the Mic. Works great. Rated 5 out of 5 by Wolfman390 from Would buy again Worked great with the goose neck microphone stand that we had. Does B&amp;H have this mount with the threads on the inside instead?